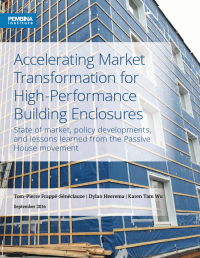 This is the first article in a three-part series based on the findings of the report Accelerating Market Transformation for High-Performance Building Enclosures. Read Part 2 and Part 3. There’s a Passive House revolution underway. It might not be obvious to all of us working in the trenches to get one more ultra energy-efficient project built, one more sustainable building policy in place. But taking a step back, we can see evidence of a market in rapid transition, showing some of the tell-tale signs of a technology leaping from niche towards mainstream. Market transformation moments are obvious in hindsight, but nebulous as they unfold. In this series of three articles, we’ll highlight three indicators that such a transformation is underway: the growing number and size of projects, the growing number of trained professionals and trades people, and the increased inclusion of Passive House principles in subnational construction policies. We’ll close the series with recommendations to accelerate this market transformation. Buildings adhering to Passive House standards use dramatically less energy than typical buildings due to a high level of insulation, high-performance windows with shading that modulate heat loss or gain, an airtight building enclosure, minimized thermal bridges, and continuous ventilation with energy recovery. Certification of Passive House buildings is based on quantitative performance targets and a series of specific requirements for thermal comfort, humidity, noise, and user satisfaction. There has been a steady growth in the number of Passive House projects in North America in the last eight years (Figure 1). More importantly, projects are growing in size and sophistication (see here, here, and here). Alongside the nimble early adopters working on custom projects, we now see larger construction companies investing time and resources to develop Passive House solutions that can compete in the multi-unit residential market. Once the projects currently on the books are completed, the number of Passive House units in North America will have grown six-fold, from 500 in 2015 to over 3,000 units. 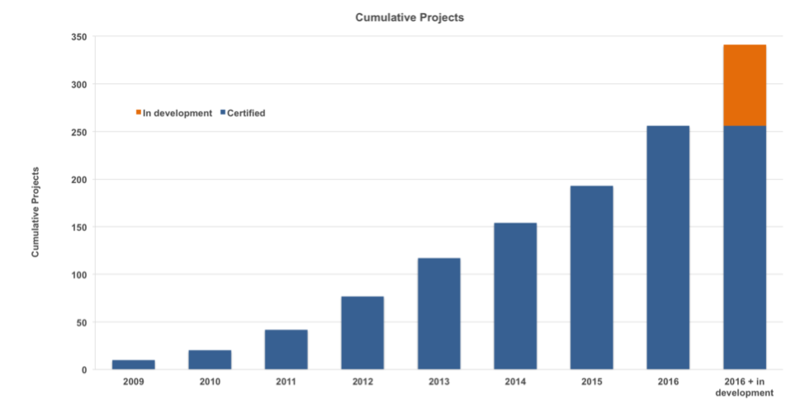 Even if some of these projects do not succeed in meeting all certification criteria, this is a significant growth in demand for high performance product and services. Figure 1. 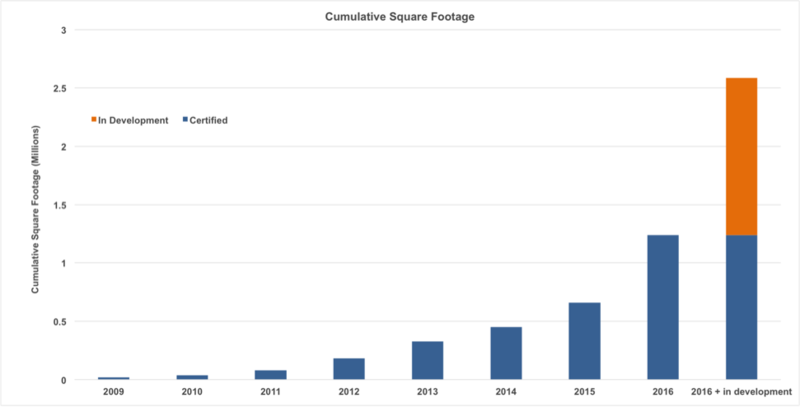 Growth in certified Passive Houses in North America (PHI and PHIUS) since 2009 by (a) number of projects (b) square footage and (c) number of residential dwellings. Note: “In development” data is a non-exhaustive scan of projects under development attempting to certify. It includes projects that PHIUS expects will be completed in 2017, projects in the Moodyville redevelopment in North Vancouver, and a non-exhaustive list of projects from one of the four PHI certifiers in Canada. This growth in number of units is mostly due to the rapid emergence of larger Passive House multi-unit residential buildings. If they deliver on the quality we expect from certified Passive House projects, these buildings will provide many more homeowners or renters with the experience of superior thermal and acoustic comfort. Demand for new products and technologies is not linear: fuelled by word of mouth and a desire to “keep up with the Joneses,” direct experience and bragging rights are a powerful social marketing force. These larger projects will also provide a large number of “mainstream” trades people, contractors, and professionals with experience on Passive House construction sites — a key factor in reducing construction costs. The number of professionals and trades workers receiving formal training in Passive House construction techniques is another indicator of market transformation. Passive House Institute U.S. (PHIUS), Passive House Canada, and the Passive House Institute (through Passive House Academy) provide training and certification programs for professionals and trades and support networks for practitioners. Demand and capacity for training has steadily increased in the last five years. 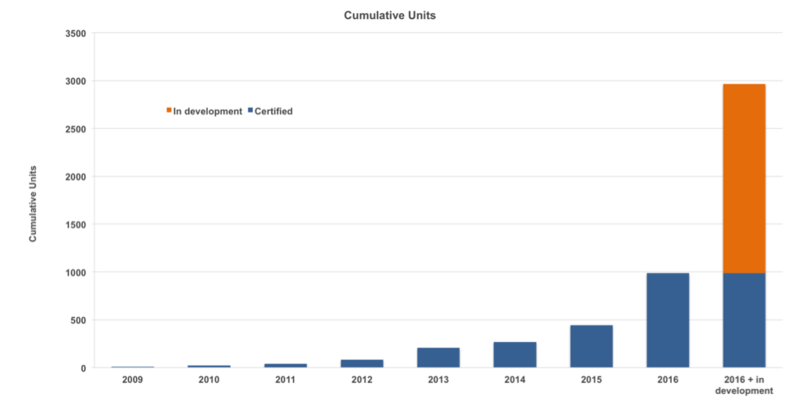 As a result, there are currently over 1,600 professionals and trades workers trained in Passive House construction in North America, with hundreds of new certifications expected in the next year (Figure 2). Data source: Passive House Canada and PHIUS. 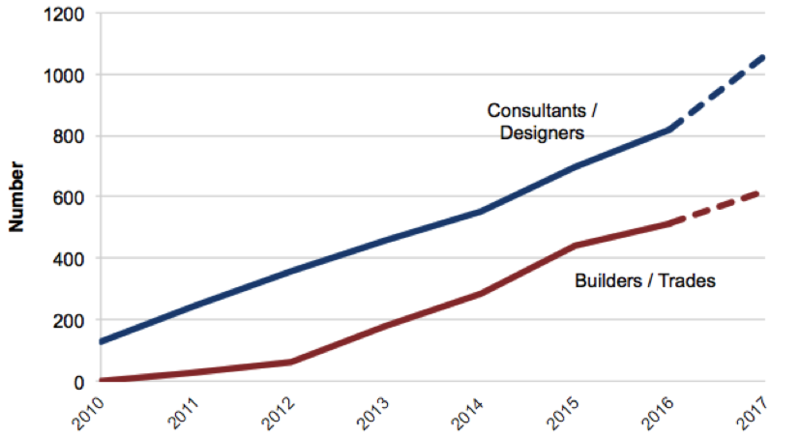 Note: the number of certified designers is not tracked by PHIUS — these figures were estimated from records of course registration and the historical pass rate on the PHIUS exam. What may matter even more than the total figure, is who is getting training. Talking with Passive House trainers in Canada, we hear that classrooms are increasingly filled with staff from large construction companies, major consultancies, and local governments. Education institutions also are integrating high performance construction principles in their curriculum, providing a base for the next generation. This broadening of the expertise base from entrepreneurial early adopters to established institutional players is a key indicator of market transformation. The community of practitioners is also becoming more widely distributed across North America. The East Coast of the U.S. has a large body of practice, along with California and the Pacific Northwest. In Canada, most practitioners are on the West Coast, followed by Ontario and Québec. However, the spread of Passive House practice goes beyond these hot spots, as there are now certified Passive House trades workers or professionals registered in most states and provinces (Figure 3). There are also over 25 chapters of Passive House Alliance U.S. and the North American Passive House Network providing facilitated and peer-led support to their more than 1,500 members. As with any systems change, movement can seem painfully incremental. It’s important to take a step back once in a while to celebrate progress. The growing number of Passive House projects built for or by large institutional players and the increasing number — and diversity — of trained professionals are good indicators of inflection points in market transformation. As we will discuss in Part 2, integration of Passive House principles and standards in public policy are other key indicators, and accelerators, of this mainstreaming. Tom-Pierre Frappé-Sénéclauze is a senior advisor with the Buildings and Urban Solutions Program at the Pembina Institute, a non-profit think-tank that advocates for strong, effective policies to support Canada’s clean energy transition. He is the lead author of the report Accelerating Market Transformation for High-Performance Building Enclosures. This article originally appeared on Insight, the blog of the Building Energy Exchange, ahead of the New York Passive House 2017 Conference & Expo. Tags: British Columbia, International, Energy Efficiency, Buildings. Tom-Pierre Frappé-Sénéclauze is the director for buildings and urban solutions at the Pembina Institute. Some might be less familiar with the Canadian scene, so we’ve dedicated this article to sharing progressive policies recently put into place on Canada’s West Coast. Deep retrofits usually involve more than 75% energy use reductions.